Following fast on the heels of the recent attention-grabbing declaration by TechCrunch’s Michael Arrington that “Nokia and Symbian are irrelevant companies at this point“, TechCrunch has published another piece of contentious analysis on iPhone vs. Symbian OS market share. On this occasion, the author is Don Reisinger. Don reassuringly writes, “I assume Symbian OS will only grow at 5 percent each quarter, since it is a mature technology”. Then he goes on to have some fun and games by considering what will happen if iPhone sales grow steadily, for the next few years (in some cases looking all the way out to 2012), at either 300% per annum, 100% per annum, or 50% per annum. 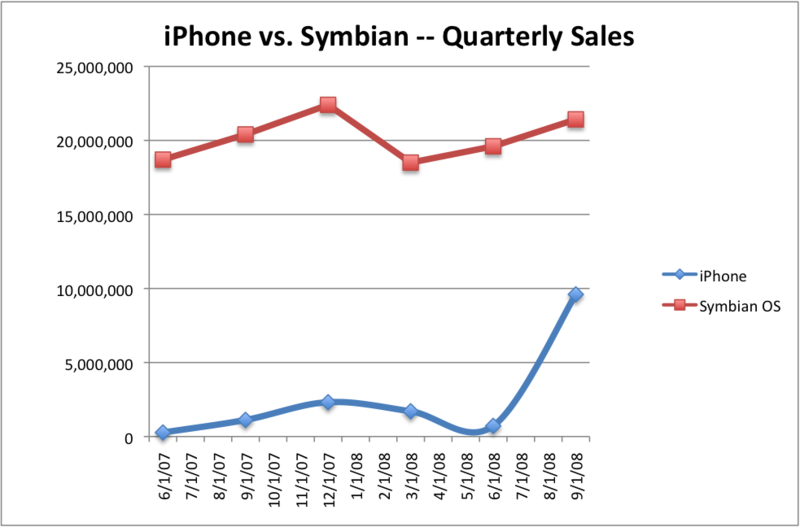 But one thing is certain: the Symbian OS is simply not selling nearly as well as the rest of the industry and the iPhone 3G is outpacing every other smartphone on the market. No. Symbian OS is currently outselling all other smartphone operating systems added together. This piece of the article makes explicit a confusion that lies under the surface of much of the rest of the article – a confusion between growth and actual value. (Mathematically, the difference between dy/dt and y itself.) 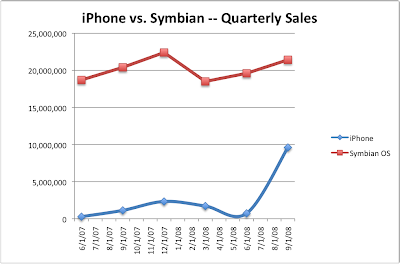 It’s true that the recent growth in Symbian OS sales has slowed down, and that the iPhone, starting from a much lower base, has achieved higher growth percentages. But that’s a very different thing. data transfer (and which therefore attract higher fees). Sales of Symbian OS phones up to the time I wrote these words had in fact been increasing, annually, at greater than 100%. Sales of 2.0 million units in 2002 had soared to 6.7 million in 2003 and again to 14.4 million in 2004. Similar percentage growth rates continued after that – for a time. Sales were 34 million in 2005, 52 million in 2006, and 77 million in 2007. Past performance (ie growth over 100% per annum) is no sure guide to future results! On the other hand – just to reiterate the point – declining sales growth is not the same thing as declining sales! A better guide to future sales prospects is probably the number of active phone projects under development. Symbian reports these figures quarterly too. As stated in our press release, there were 92 Symbian phone models (to our knowledge) in development at the end of June. That’s a 48% increase from the same figure last year – 62 models. It’s also by some way the largest value this figure has been. 76% growth in consulting services from £5.1 million in H1 2007 to £9.0 million in H1 2008 driven by a demand for Symbian services resulting from a broader and deeper range of customer mobile phone products in the pipeline. What factors will, instead, govern future sales of iPhones? I’ve previously discussed some of the potential breakthrough features in this device. But what prevents these features being emulated by products from competitors – including some of the 92+ new products under development using Symbian OS? – the iPhone has a large (320 by 480, 4″), patented capacitive display that’s touch-sensitive and yet has super visibility in all light conditions, something that was previously impossible. – the iPhone is almost always on a flat rate, all you can eat data tariff, which means applications can assume full Internet connectivity, bandwidth no object. – the iPhone has a built-in, callable version of Google Maps and a good YouTube client. – the iPhone is fully location aware, using cell towers, Skyhook Wi-Fi location (this works exceptionally well in towns) and (in the 3G model) full GPS. (I’m tempted to add a fifth reason – that the Mac-loving, iPhone-loving crowd have more imagination and creativity than their equivalents in the Windows and Symbian worlds). …here’s the kicker – there’s no reason why similar levels of imagination and integration shouldn’t happen on S60 and Symbian – with Maps/Chat/Ovi, progress is being made. But if I’m honest, Apple’s iPhone platform has already seized the technological high ground – in this area, at least. – the unusual E90 aside, the largest screen sizes in common use in the S60 world are 2.8″, half the size of the iPhone’s display (in terms of area) and many phone displays are 2.4″ or even 2.2″ (which works out as just over a quarter the area of the iPhone’s). Bigger displays are needed and of higher resolution. No doubt these will come, and at least outdoor contrast is very good on most S60 devices, but in the meantime it’s again advantage iPhone. every pay-as-you-go SIM allowed unlimited data for a day for a nominal fee (e.g. £1). Until people reach the point where they don’t worry about how much Internet is costing them on their mobiles, they’ll be suspicious and, again, at a disadvantage to the more expensive, but worry-free, iPhone. – Google Maps is already native S60, which is good, although it’s not as slick as the iPhone implementation. But YouTube playback is a toss-up between the low resolution official Java client or the third party and slicker (but often unreliable) S60 app Mobitubia. Yet again, advantage iPhone. – with almost every S60 device now coming with built-in GPS and an OS that allows positioning to be accessed from any application, location useage is simply down to the skill and imagination of developers. We’re starting to see S60 apps that use GPS, but it’s still early days, it seems. I don’t want to sound too negative – I love my S60 phones and I love the high performance, high speed nature of Symbian OS. But credit where credit’s due – hopefully you’ll agree that the above two iPhone application examples are nothing short of inspiring – whichever platform you use or develop for. The killer question is: can the successes of the iPhone indeed inspire similar applications, services, and devices from competing platforms? Can other platforms support devices that have a similary gorgeous screen, a first rate web browser, flat rate data tariffs, and rich callable middleware? If this is possible, the TechCrunch sales projections are dubious. Personally, I don’t think these successes can be fully emulated by in-house proprietary operating systems – but the answer changes when the underlying software system becomes sufficiently sophisticated, flexible, and robust. That is, feature phones cannot compete with these devices – but smartphones can. With these complex products, innovation requires underlying strength. Maturity, as Don Reisinger calls it, doesn’t need to mean sales stasis: it can mean the basis for very significant new innovation and new sales spurts – especially when coupled with the kind of restructuring that will follow from Nokia’s planned acquisition of Symbian and the formation of the open source Symbian Foundation.